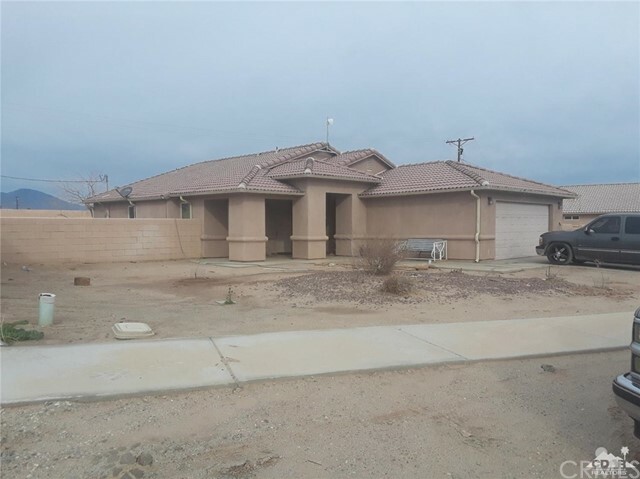 All Thermal homes currently listed for sale in Thermal as of 04/25/2019 are shown below. You can change the search criteria at any time by pressing the 'Change Search' button below. If you have any questions or you would like more information about any Thermal homes for sale or other Thermal real estate, please contact us and one of our knowledgeable Thermal REALTORS® would be pleased to assist you. "The ultimate equestrian estate in Vista Santa Rosa! This privately gated state of the art horse facility encompasses over 58 acres. Tree lined drive over two lakes to a stunning formal entry. Estate home of 6,179 sq. ft. features formal living room w/beautiful fireplace and a custom bar right out of the old west. Gourmet kitchen with center island, wrap around counter bar, top of the line appliances, and butler's pantry. Morning room, family room and custom wine cellar. There is an amazing use of stone & wood finishes throughout. The large master suite has a sitting room and private patio with fireplace. An inviting guest suite with patio and two handsome offices with built-ins. There is a charming 1,791 sq. ft. guest house with 2 bedrooms and two baths w/exercise/hobby room. The grounds are incredible and include a 5,625 sq. ft. barn, the largest riding arena in the valley, a two bedroom caretakers house of 1,400 sq. ft., pastures, growing alfalfa and more!" 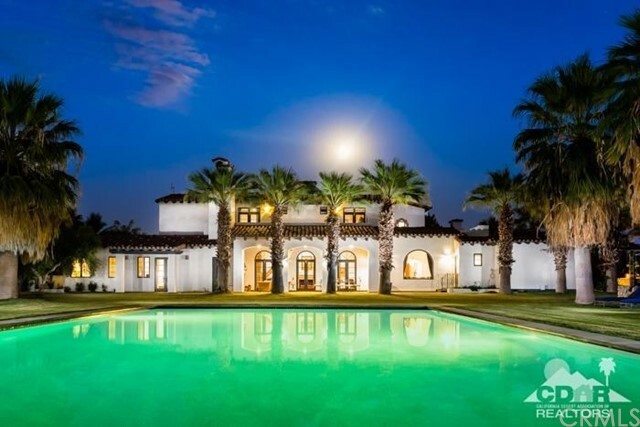 "Welcome to Rancho La Serena - This stunning private compound is located in the highly coveted Vista Santa Rosa area of the Coachella Valley, just one mile from private jet hub, Cochran Airfield. 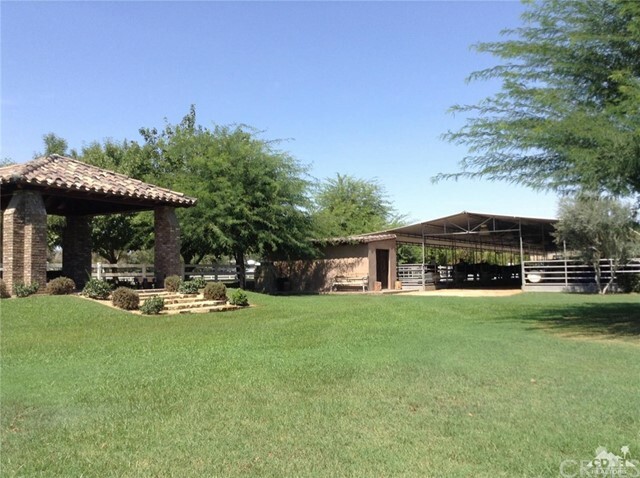 Located just down the street from the Empire and Eldorado Polo Clubs as well as nationally renowned HITS Desert Horse Park, this property is a horse-lover's dream. This expansive 20-acre working ranch includes a newly constructed European style 7 bedroom, 9 bath home with 8170 SF; including 2 bedroom, 2 bath guest house, saltwater pool, spa and ample patio areas. Quality craftsmanship, exceptional taste, design and style. The horse facility includes a portable 8-stall barn, lunging pen, hot walker, open pastures, 2.5 acre cross-country course, jumping arena, exercise arena, and stick & ball field for polo practice. Plus, revenue-producing Date Palm farm and Rubosta Palm tree farm. Includes deeded Colorado River water rights & low taxes in designated Agriculture Reserve. Please see video." "This Luxury Villa features 5 bedrooms, 8 bathrooms, an incredible garage for up to 26 cars, and is located in The Thermal Club the ultimate private Motorsports facility with access to 5.1 miles of private pavement and luxury amenities for members. The Residence has been custom built in a duplex style, with a 3-bedroom owner s unit on one side, and a 2-bedroom guest unit on the other, each with tastefully appointed kitchens and bathrooms, and spacious living areas ideal for privacy and entertaining alike. 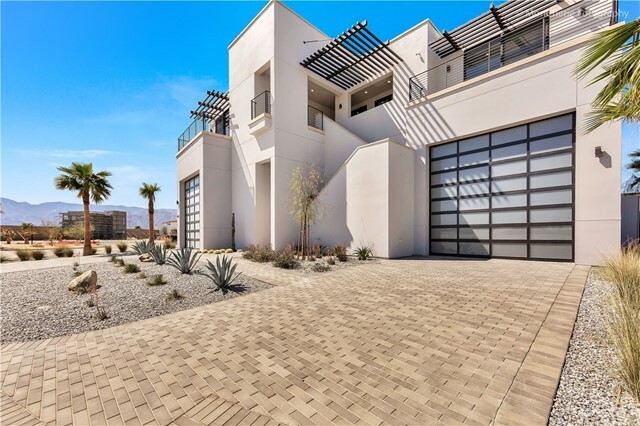 Both sides are connected by a sweeping balcony overlooking the North Palm Circuit, with panoramic desert and mountain views. The Residence is located above the two-story garage, accessible by stairs or elevator. The Garage features space for up to 26 cars, two 10,000 lb rotary lifts, space for tools and equipment, an office/storage room, surround sound, Wi-Fi, climate control, ORCO Block construction, crew bathroom with shower and stack-able washer and dryer. The garage also features a spacious mezzanine with three windows overlooking the track, weather tech floors, wall bed, and a well-equipped gym with Rogue weights and rack, Peloton bike, Water Rower, and Woodway Curve treadmill. This Villa is an absolute must-see." "Welcome to Valor Farm in Thermal, CA. Approximately 4.8 gated and secure acres, (could be 9.9! 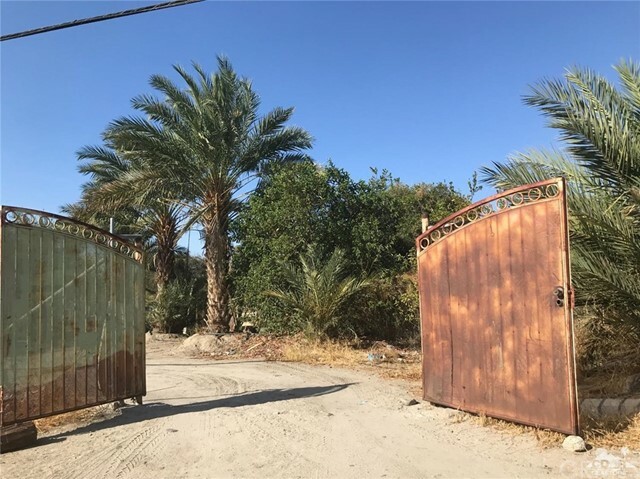 ), allowing up to 5 horses/acre, the custom, electronic entry gate slides open to reveal a private driveway lined with date palms and citrus trees. Pass the Two large grass pastures with shade palapas and new fencing, as you approach the sleek, modern, and sophisticated ranch house. Disappearing walls on the east and west side of the house, concrete floor tile that runs inside and out, Yellow Pine natural wood ceilings, and Caesar stone countertops are just some of the contemporary finishes completed in 2017. Offering five bedrooms and 3 1/2 bathrooms, plus an outdoor entertainment center with firepit, spa, table game area and cooks' station. The seven car, climate controlled garage, with it's attached, classy, lounge area were also completed in 2017. A Generator & 500 gallon propane tank, add to the efficiency of Valor Farm." 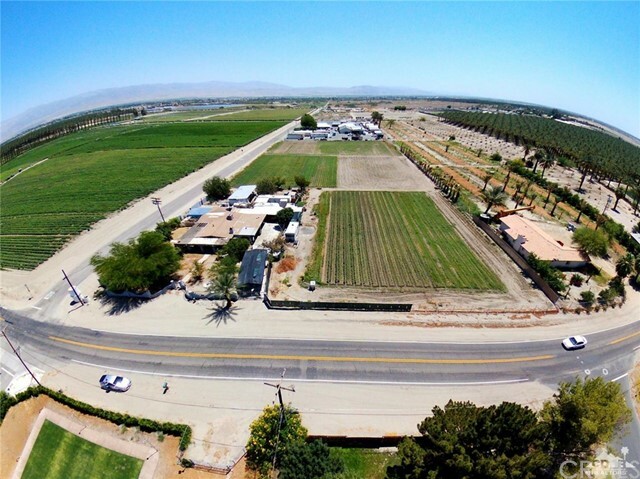 "Beautiful, manageable farm in Thermal, CA. 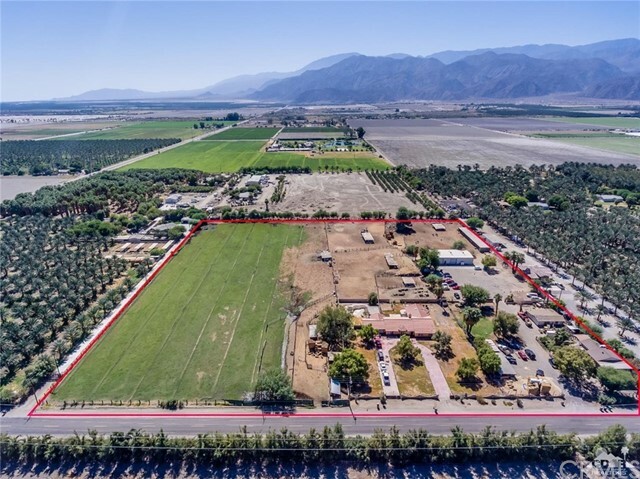 20 acres, fully fenced and offering both a private WELL and CVWD water for irrigation. Three large, grassy pastures, a 10-stall Breezeway barn with grooms' quarters; complete with a bathroom, and wall A/C units. Comfortable, 4 bedroom, 2 bathroom Mobile home with covered parking, and an attached garage. Original adobe guest home remodeled in 2017, and horse safe fencing also added in 2017 around the exterior. PLUS a Covered Hay Barn & storage garage, and a Hot-walker. Electronic security gates, open to the driveway, with Paved road frontage onto 61st. It is approx. 1/2 mile from Hwy. 86. HITS showgrounds are approx. 4 miles, Eldorado & Empire Polo fields approx. 15 minute with a trailer, the Thermal Club and also Jacqueline Cochran Regional Airport are a short drive. Shopping and Gas are approx. 5 miles away in Coachella. Surrounded by Date Farms, the soil is fertile, and the VIEWS are superb!" "10 acre ranch with 2,500 sf 3 bed/2.5 bath, plus den, estate home with pool. 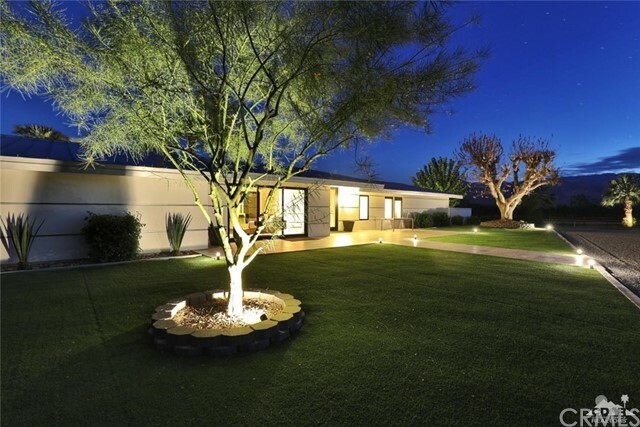 Just 2 miles from El Dorado & Empire Polo fields, home of the famous Coachella Music Festival. In the sphere of influence of the city of La Quinta. Close to many high-end country clubs, including the exclusive Griffin Ranch and The Hideaway. Approximately 2,000 palm trees on the Property, a sellable commodity. In an area of many exclusive equestrian estates. 1/2 mile from Madison Club & PGA West. All utilities underground. The opportunities for this property are endless!" 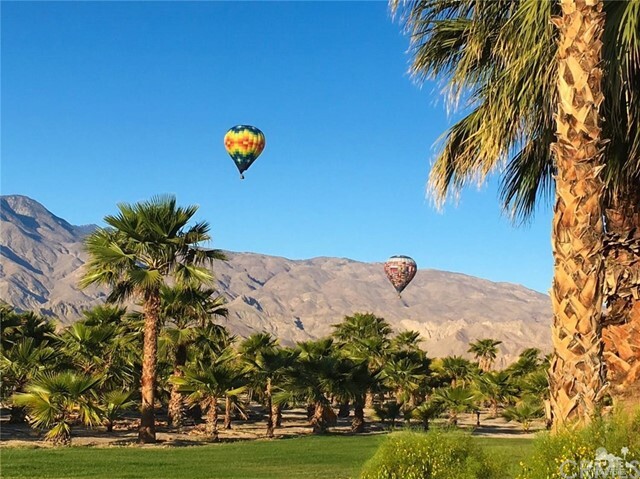 "A true oasis in the Coachella Valley! Located in a gated equestrian community just minutes from fine dining, golf, world class horse shows, tennis, polo clubs and international music festival venues. 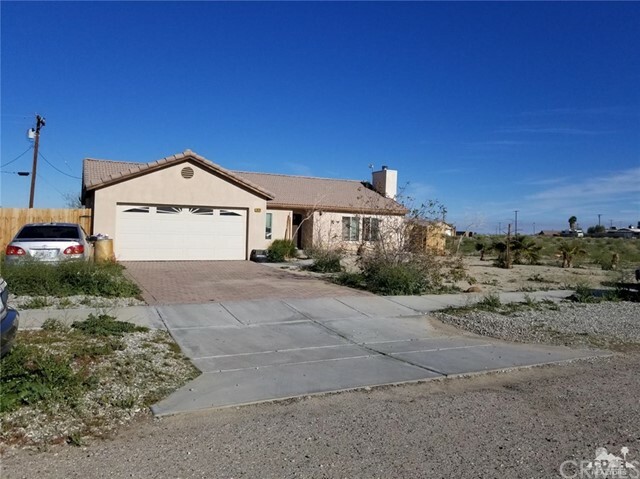 This property set in the ideal southern California desert climate features: One bedroom casita, 20 stall barn, 4 stall mare barn, large tack room, laundry/bath room in barn, gazebo, multiple wash racks, hay storage barn and seven separate irrigated grass pastures. Shad trees provide greener and shade to pastures and nearly every area of the property. Huge flat space for a jumping or riding arena located in the center of the barn area. Horse safe fencing and a manicured track with private polo field just beyond your front gate. This equestrian horse park provides many benefits some of which are: irrigation of your pastures, manure removal, manicured track and training areas, secure gated entrance and equestrian friendly environment. Both equines and humans will truly relax here." "This nearly 10 acre parcel has enormous potential. Currently there are two homes on the property - both rented out, a local landscape company uses a portion of the property with a warehouse and a large portion is being used for agricultural purposes." "Red Bridge Farm is a stunning 40-acre Ranch that is ready for your enjoyment or work purposes. 1,700 square foot manufactured home centers the property and includes 3 bedrooms, 2 bathrooms and has recently been attached to a permanent foundation. Also, there is a 2,400 square foot medal workshop with ample 400-amp 3 phase power, already framed for additional square footage and is perfect for storage or processing of goods. 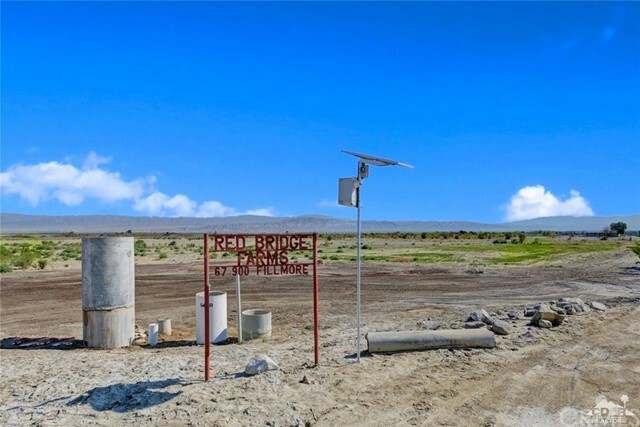 There is no shortage of water, this property has access to an 800-foot-deep well and canal water for irrigation. Allowed uses in A-1 zone: farming, nurseries, greenhouses, orchards, packing and processing of dates and agricultural products, raising farm animals, horses cattle and much more." "Property was appraised at $900,000. Investors! You can own approximately 19.65 acres of all usable, agriculturally zoned land. The lot has two houses, two work sheds and four storage sheds. There are two separate septic tanks. The manufactured home is a 3 bedroom/2 bath built in 2000. The main house was built in 1958 and has 3 bedrooms/1 bath. Also on the lot is a leased cell tower which provides monthly income (cell tower lease must be sold with the property). Very close to the BMW Performance Center, a racing school which is open to the public and sure to attract race car enthusiasts and drivers. The property is also close to the Thermal Airport, golf courses, and the Fantasy Springs Resort & Casino. The city of Thermal has invested about $20 million in infrastructure road improvements and water pipes especially all of which will benefit the area. All the more impressive, Riverside County has approved plans for more than 10,000 new homes in the unincorporated area on paper. This property is ready for you to invest now." "Welcome to Rancho del Sueo! This totally established date farm features multiple structures on over 10 acres with 3 water sources! The main home is a block structure & features 3 bedrooms & 2 bathrooms with central air conditioning & a wood burning fireplace. There is a large structure with a roll up door for equipment & vehicle storage. The packing house was designed for the processing of dates & includes cold storage, a loading dock, & a bathroom with a dedicated septic system. There are two additional mobile homes each with their own septic systems. There are approx. 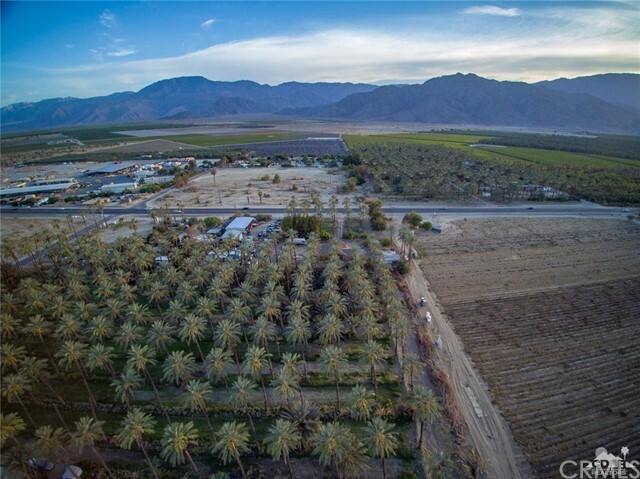 110 date palms on the east side of the property & 75 on the west side with a nearly 3 acre paddock in the center. 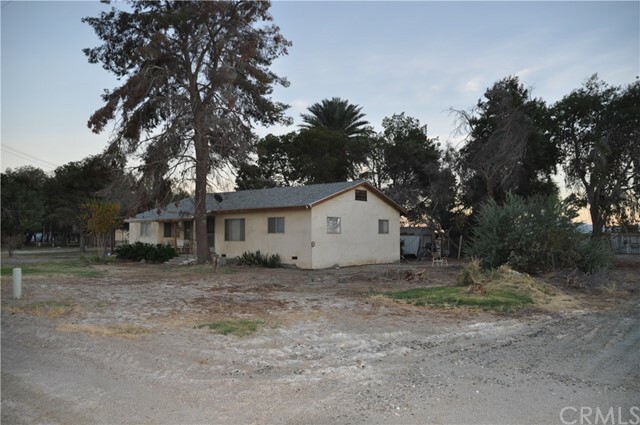 The property has a private well, All-American Canal water managed by CVWD, & domestic water service. 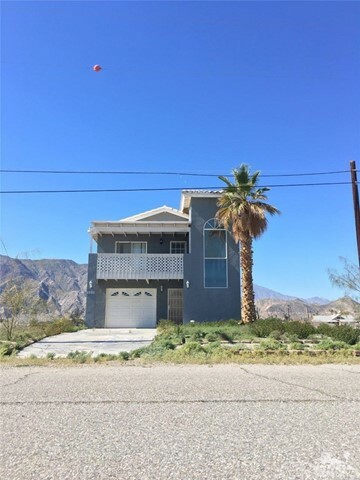 Expansive mountain views, flat lot, and excellent location make this property a unique find. Close proximity to HITS Horse Show, Thermal Club, Jacqueline Cochran Airport, & world-famous Empire Polo Club." "There are a Medjool + - 195 Date in production. and some Chutes ready to sell today. 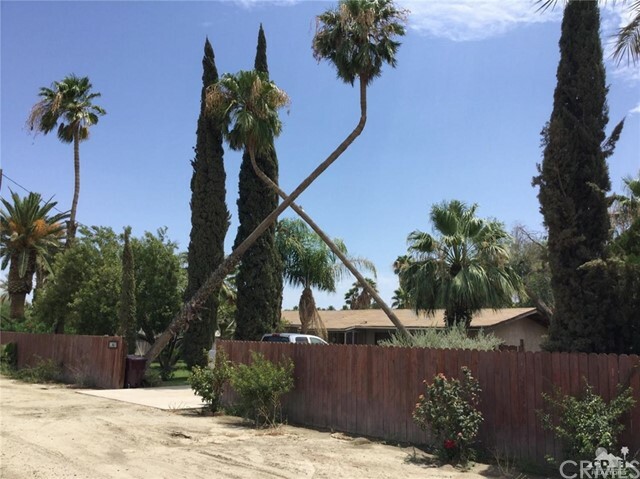 Mobile home and well, CWD for irrigation, is the right location for any local farmer, on the right side of the property is and other property and is part for sale 29.80 acres part of sale for $1,650.00.....Este Rancho con palmas de Medjjol con + - 195 Arboles, Mobile home Pozo y CWD Para el irrigacion, y muchos chutes para venderlos, Localizacion es lo mas importe de cualquier propiedad, en la parte derecha esta la segunda parte de a la venta de 29.80 Acres por $1,650,000.00"
"A great investment opportunity for someone! Nice approx. 10 acre sized farm currently planted in date trees. Older home one bedroom -one bath and older two bedroom -one bath double wide convey with the property. 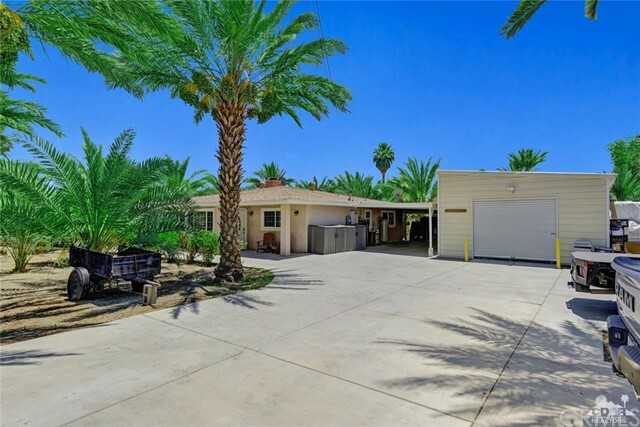 This ranch is set in a rural and quiet area of the Coachella Valley. The home has mature landscaping and garden features surrounding it. Operational well and two septic systems on site. Owner does want to remain on the property for 3 years but a new owner could develop the back part of the property. Date trees can stay or go with the deal for an additional small fee. Date trees include: 205 Zahidi, 30 Deglet, 210 Medjool, 108 unisex and 15 male. Looking for an existing date grove farm at a great price look no further. Owner will carry paper for the right buyer. 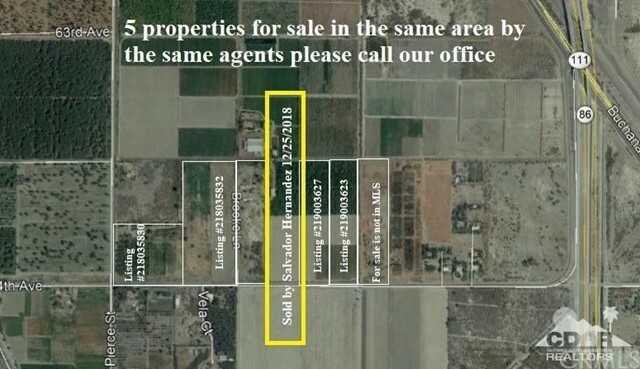 Owner will clean property up prior to close of escrow"
"Look at this Agricultural Land Located In Thermal, ready for you to grow and Plant, land has a well, Large acreage space with desert mountain views, close to other desert cities. Open Lot makes this land and endless possibilities of things to do. current seller has planted a variety of vegetables making this land very well fruitful. This Agricultural land comes with a 3 bedroom 2 bath home, with a wrap around porch and fireplace. home has a block wall which makes this very private. 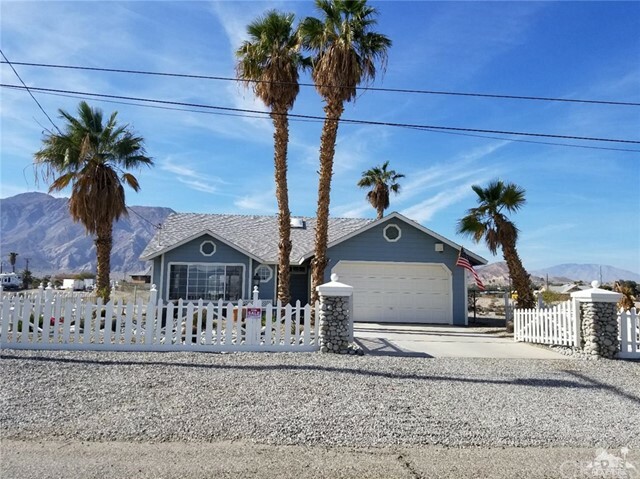 Included in the sale are 2 mobile homes as well that are currently leased out by long term renters, Come schedule a private viewing you won't be disappointed." "Single family home, packing facility, refrigeration and date farm. Enter through the electric front gate to the vast cemented driveway, carport and loading area, large enough for all types of commercial vehicles. Packing facility offers: 1,500 sq. ft. shed, graded floors, insulated walls/roof, plumbing, water heater, electricity, restroom, 500 sq. ft refrigerator and dehumidifying system. This property also includes a single-family residence which offers three bedrooms, two baths and almost 1569 sq. ft. The kitchen has been recently remodeled with solid high gloss cabinets, granite counters, commercial faucet and stainless-steal appliances. Living room features include media shelf, built-in book shelves, in-wall wiring and wood burning corner fireplace. The master suite includes stained concrete floors, updated window blinds and custom lighting. Enjoy the remodeled master bath with updated electrical, lighting, plumbing, custom shower enclosure, and walk-in closet with ample storage." "One of the Coachella Valley's Charming old Adobe homes, circa 1930, that's sitting on a large, fenced lot surrounded by open spaces. Featuring a private well, and across the street from a private Polo Field, you are a short drive to the famous Music Festival/Polo grounds. Featuring 3 bedrooms/2 bathrooms/formal dining area and a warm living room with a wood burning fireplace. Smooth plaster walls and ceilings for most of the home with some gorgeous exposed wood beams. There is even a Basement! A non-permitted, sub-metered Warehouse, with a studio apt. with kitchen & bathroom sits behind the home. This building offers loads of space for cars, trucks, art studio, hay storage, paintball practice, batting practice cages, perhaps a Karate studio?? Lots of possibilities for this one! Appointment only; full time resident." "The value of this property is in the land, almost two acres, this property has a private well with a little house. 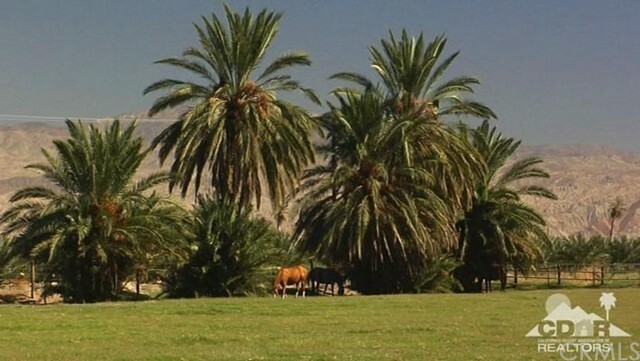 There are a few date palm trees that come with the property. Don't wait this little Rancho will not last at this price. Owner financing with a good downpayment." "Another Move in Ready HomePath Property! Wow what a great home! Located in Thermal, just south of Avenue 52 off Calhoun. Properties rarely come on the market in this neighborhood. Home is situated on a spacious lot with over 10,000 sq ft. Home shows amazing! Very nicely upgraded throughout! Desirable floor plan offers 1,612 sq ft. Open kitchen, large living room, dining area, 3 bedrooms, and 2 baths. Brand new Kitchen has new cabinets, new stainless steel appliances, and beautiful new quartz counter tops. Both bathrooms have been nicely updated. Master bath offers a large walk in shower. Beautiful new flooring throughout. Both interior and exterior have been freshly painted. 2 car de-attached garage. Nice curb appeal with mature trees. Spacious yard has an extended cover patio; perfect for outdoor entertaining. Quiet, desirable neighborhood. Close to shopping and schools. Shows Fabulous! This is a must see home! Won't last!" 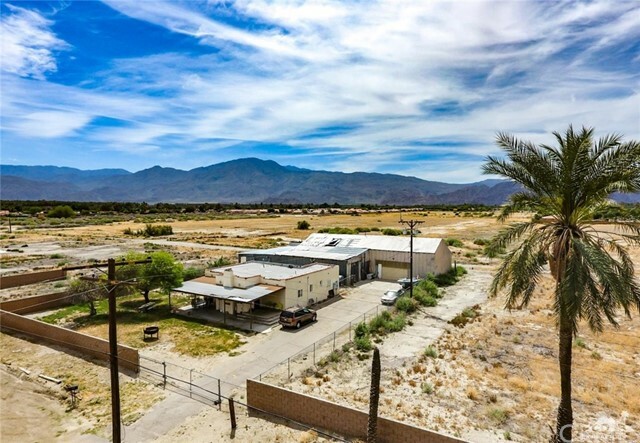 "Breathtaking views of the Salton Sea and the surrounding mountains! This property was recently remodeled and offers a perfect getaway spot or a relaxing place to call home... Both front and rear upstairs decks provide for relaxing days and gorgeous sunsets." 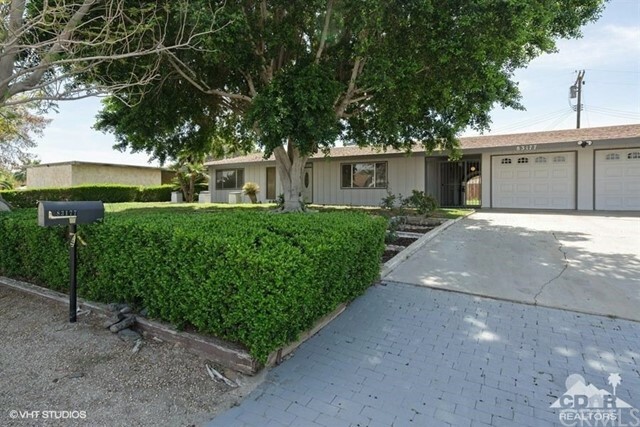 "Extra, Extra huge price reduction!Beautiful Salton City home with an incredibly sized 15,000 square foot lot. The house and its yard is completely gated with block wall and comes complete with RV parking. Beautiful covered patio with above-ground Jacuzzi.. This home has all the luxuries; an open-concept living area, large kitchen equipped with ample storage space, fireplace, large laundry room, huge master bedroom, and soft water system. At this price it will not last, so submit an offer today." "Amazing custom built home. This is worth every penny you are going to invest in this one of a kind home. From the moment you pull up to this house the beautiful curb appeal will grab your attention. As soon as you walk in to the house you will realize how much care is gone into the construction and maintenance of this home. When you sit in this incredible living room and look out the nice big bay window and admire the incredible views that you can admire at any time of the day you will soon feel inspired and amazed in this one of a kind home. Perfect for someone that wants to come and relax, get inspired, even come write the next big novel or rent it out as a destination spot. This is the kind of home you just want everyone to enjoy and get an opportunity to experience. With 2 bedrooms and 2 bathrooms and incredible patio in the back and a doc as well you just have to come and experience this home for yourself. Too many incredible things to say and not enough room to type them in." "Talk about location...location!!! This home is a few steps to West Shores High School, and close to elementary school. This is truly the perfect house for our first time home buyers. At the entrance you will find yourself in a spacious living room which has a fireplace to warm up during those cold desert days. Dining area and kitchen have immediate access to a yard with plenty of land to build a pool or upgrade to a unique outdoor living space. This property has 3 bedrooms down the hallway and 3 bathrooms. The laundry room has plenty of space. I invite you to come and see this lovely home. Will not last!!" "Great Location! 4 Bedroom, 2 Bathroom Home with a Large Family Kitchen with Granite countertops, Dining area, Big Living Room, Vaulted Ceilings throughout. Covered front patio, 2 Car Garage! All situated on a Large Lot on a street with a Cul-de-sac!" "Beautiful floor plan on a very private street. This house has granite counter tops through out the house with large tile in the Kitchen and bathrooms. Open floor plan, great for entertaining. Separate Laundry room that leads to the garage and a beautiful Master bedroom that has a amazing view of the Lake. separate tub and shower with a double vanity sink. The back yard is beautifully thought out by having the fence low enough to enjoy all the beautiful views that the lake offers mornings and nights."